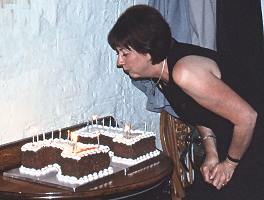 Judith Egan-Shuttler (the editor of JAAS in its formative years) blowing out the candles on the anniversary cake. The ASU Annual Board Meeting was held at Glasgow Caledonian University on 13 July 2006 immediately after the 13th BNASS Conference. The ASU Board Dinner was a celebration of 21 years of ASU and was held at The Ubiquitous Chip in the West End of Glasgow. The Board was honoured to have a number of guests who made significant contributions to ASU in the past (Helen Crews, Les Ebdon, Judith Egan-Shuttler, Steve Haswell, John Marshall, Linda Owen, Barry Sharp and Ian Shuttler). We also welcomed Barbara and Nairn Balfour (representing the late John Ottaway) and Dorothy Ure (representing the late Allan Ure). Unfortunately, two of our longest serving members, John Dawson and W.John Price, were unable to join us. Both served ARASS, ASU's predecessor. The Chairman, Phil Potts, in his speech read out a moving letter from John Dawson explaining how his infirmity limited his life at the moment but putting great emphasis on what ASU had achieved and the sense of comradeship he found from its members. Standing behind left to right: Christine Vanhoof, Jason Day, Andrew Taylor, Phil Goodall, Christina Streli, Steve Hill, Simon Branch, Hywel Evans, Mark White, Chris Harrington and Jeff Bacon.